Hit the road for an exciting sightseeing vacation aboard the Summer Camper. Kids can remove the roof to access the interior of the camper, outfitted with plenty of space for everything needed while traveling. Whip up some tasty meals in the small kitchen area with sink and stove. Food, dishes and silverware are stored in compartments at the back of the camper next to the kitchen for easy access. Two adult mattresses can be fitted over the driver seats in the front of the camper, while two child mattresses fit into the rear of the vehicle, creating cozy bunk beds. Avoid rest stop interruptions thanks to the onboard bathroom. When the weather is nice, the family can eat outside under the camper’s retractable awning. 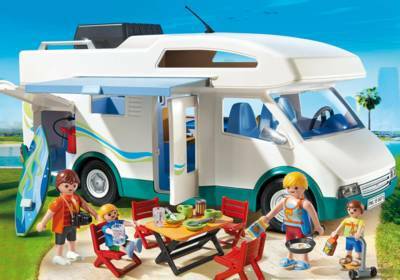 Set includes two adult figures, two child figures, mattresses, table, four chairs, dishes, pot, pan, silverware, food, fire extinguisher, surfboard, and lots of other accessories. Dimensions: 12.6 x 5.1 x 5.9 in (LxWxH).